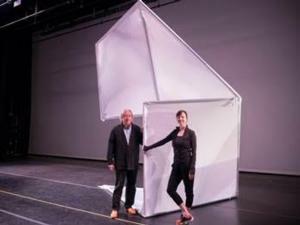 The Harris Theater for Music and Dance is proud to present the world premiere of Tesseracts of Time; a brand new collaboration by renowned choreographer Jessica Lang and celebrated architect Steven Holl, performed by Jessica Lang Dance and commissioned by the Chicago Architecture Biennial. After being called a “can’t miss” performance by the Chicago Tribune, Chicago Sun-Times, Chicago Magazine, and many other publications, this is a premier highlight of the Fall dance season, arriving at the Harris on Friday, November 6 at 8PM. Full program is below. Tesseracts of Time relates to the four types of architecture: Under, In, On, and Over. Tesseracts of Time demonstrates how the two worlds of architecture and dance merge with respect to time; architecture is one of the arts’ longest in duration, while the realization of a dance piece can be a quick process where the work disappears as the performance of it unfolds. In this work, one can imagine the four stages like the four seasons which are compressed into just twenty minutes. This compressed ratio would render an average human life as four years. Jessica Lang has been hailed as “a master of visual composition” by Dance Magazine and is known for her striking design elements, and emotionally engaging contemporary works. Lang is a New York City Center Fellow for 2015 and the recipient of the prestigious 2014 Bessie Award. Her company, Jessica Lang Dance, was created through Lang’s receipt of a Joyce Theater Artist Residency and has made rapid success performing at renowned venues and festivals around the country including Brooklyn Academy of Music’s Next Wave Festival, Jacob’s Pillow Dance Festival, New York City Center’s Fall for Dance Festival, the Kennedy Center Concert Hall, the Joyce Theater and the Winspear Opera House in Dallas, TX. Considered one of America’s most important architects, Steven Holl is recognized for his ability to blend space and light with great contextual sensitivity and to utilize the unique qualities of each project to create a concept-driven design. He specializes in seamlessly integrating new projects into contexts with particular cultural and historic importance. Holl has been honored with Japan’s Praemium Imperiale (2014), the AIA Gold Medal (2012), Royal Institute of British Architects Fellowship (2002) and the Grand Medaille d’Or (2001) among many other awards and is a tenured Professor at Columbia University’s Graduate School of Architecture and Planning. Steven Holl Architects have realized cultural, civic, university, and residential projects in the U.S. and around the world, most recently the Reid Building at The Glasgow School of Art in Glasgow, United Kingdom (2014), and currently the Expansion Project for the John F. Kennedy Center for the Performing Arts, The Museum of Fine Arts Houston, and the new wing for the Mumbai City Museum. The architecture used in the dance was developed through a research project called ‘Explorations of IN.’ This project started June 2014 at Steven Holl Architects and explores questions of architectural language. It aims to re-value the Art of Architecture. Lang and Holl carefully chose music that has influenced them both in their individual work, and for its architectonic qualities, studied at Columbia University’s design program The Architectonics of Music, led by Steven Holl and Dimitra Tsachrelia. This “dance for architecture” is set to music by David Lang, Morton Feldman, John Cage, Iannis Xenakis and Arvo Pärt. Single tickets now available at www.HarrisTheaterChicago.org or by calling the Harris Theater Box Office at 312.334.7777. Jessica Lang Dance will also be performing on Thursday, November 5 as part of the Harris Theater’s new MIX at SIX series. MIX at SIX is the Harris’ first ever happy hour performance series featuring six after work performances throughout the season. Beginning at 6PM, these performances see renowned artists from around the world performing fast-paced, one-hour performances after work. Enjoy signature cocktails from Harris Theater and food from Chicago’s most in demand food trucks, available for purchase on Lower Randolph outside the lobbies. MIX at SIX subscriptions for the full series are available now for $50; single tickets are $10. To purchase tickets, please visit www.HarrisTheaterChicago.org or call 312.334.7777. This performance is made possible with support from Abby McCormick O’Neil and D. Carroll Joynes, Lead Sponsors. The Harris Theater is proud to have the support of The Northern Trust Company as its 2015–2016 season sponsor. United Airlines is the Official and Exclusive Airline of the Harris Theater. Hyatt Regency Chicago is the Harris Theater’s season hotel partner. The Theater also gratefully acknowledges the Irving Harris Foundation for its leadership support of the Presenting Fund. The Harris Theater is partially supported by the Illinois Arts Council Agency. All performances take place on The Elizabeth Morse Genius Stage at the Harris Theater. The Harris Theater’s mission is to partner with an array of Chicago’s emerging and midsize performing arts organizations to help them build infrastructure and achieve artistic growth and long-term organizational sustainability. Opened on November 8, 2003, the Harris Theater for Music and Dance was the first multi-use performing arts venue to be built in the Chicago downtown area since 1929. Today the Theater continues to host the most diverse offerings of any venue in Chicago, featuring the city’s world-renowned music and dance institutions and the Harris Theater Presents series of acclaimed national and international artists and ensembles. The Harris Theater maintains a commitment to engaging Chicago residents of all ages and communities. Programs like the popular Eat to the Beat and Exelon Family Series advance access to, and understanding of, the performing arts. The Theater partners with health and human service agencies, K-12 schools, and community arts organizations, providing more than 8,800 underwritten performance tickets through the Access Tickets Program since 2009. The Theater also connects gifted young artists and students to presented artists through master classes, artist talks, and other enrichment activities.